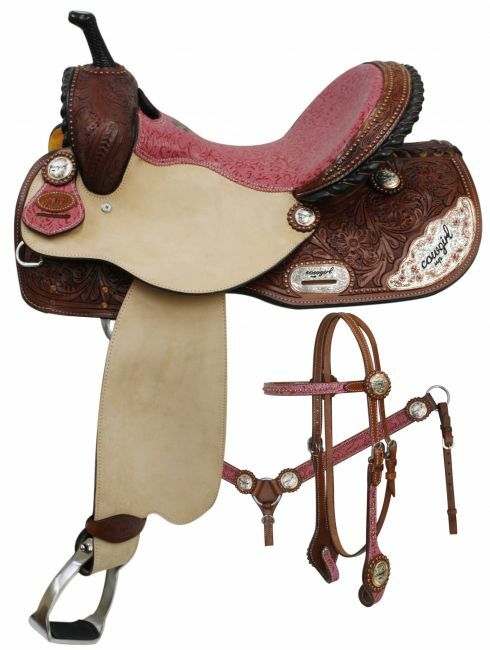 14" 15" 16" Double T Barrel Style Saddle Set with Cowgirl Up Engraved Silver. This saddle features Medium oil floral tooled skirts, pommel and cantle. Pink filigree top grain leather seat. Rough out fenders and jockeys. 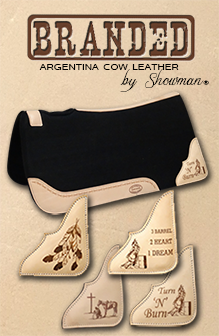 Skirts feature engraved silver conchos and silver plates with " cowgirl up" accented with rose gold color accents. Made byDouble T Saddlery. Matching headstall and breast collar set features pink filigree overlay accented with copper colored studs and engraved silver " Cowgirl Up" conchos. Headstall comes with 5/8" x 7' leather reins.